Walt Disney World has implemented a reservation system at many of its “quick service” restaurants which not only allows them to seat guests quickly but allows them to see an increase in profits as well. The former practice of saving tables while another place an order for food is no longer allowed during times when the parks are experiencing peak traffic. Inside four quick-service restaurants in the Magic Kingdom, Disney has begun restricting access — but guaranteeing seating — during busy lunch rushes. Managers say the approach helps smooth out traffic in part by eliminating the need for groups to split up and send someone to order food while another person holds an open table — something that can clog up as much as one-third of a restaurant’s capacity at any given time. “This has been very helpful for us from an efficiency standpoint, because everything’s so well-organized,” said Liz Clark, general manager of food and beverage in the Magic Kingdom. Busy, in-park restaurants are an obvious target for improvements as on a busy days they can rival the longest ride queues in terms of crowds, noise and stress levels. “It wasn’t really a good way to decompress or relax. So we’ve been really focusing on how we can enhance the whole dining experience,” Clark said. Under the controlled-access and -seating program, guests in certain Magic Kingdom counter-service restaurants are guided through a single entrance so workers can keep tabs on how many people are inside. A greeter hands menus and directs the entire group to cash registers to place their orders. After they get their food, they are guided by another cast member to an empty table. Implementing the change is trickier than it may sound. For example, the restaurants have multiple entrances, so Disney restaurant managers have had to work with “Imagineers” to work out new ways of guiding traffic through a single point. Clark said the program has already evolved based on feedback from guests. The menus that greeters initially handed out were only available in English and were done entirely in text. They have since been changed to include multiple languages, pictures of the menu selections, and information about using a pre-purchased dining plan that Disney sells to resort guests. 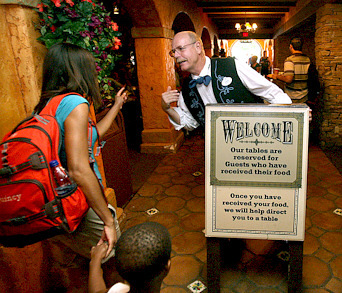 Disney began testing the concept in the Pecos Bill Tall Tale Inn and Café. But it has since been rolled out to three other busy counter-service restaurants: Columbia Harbour House, Pinocchio Village Haus and Cosmic Ray’s Starlight Café. Those restaurants range in size from about 400 seats to more than 1,000 at Pecos Bill and Cosmic Ray’s. This new system is only being used when that day’s park attendance warrants it. Original articles at Orlando Sentinel and Examiner.com.